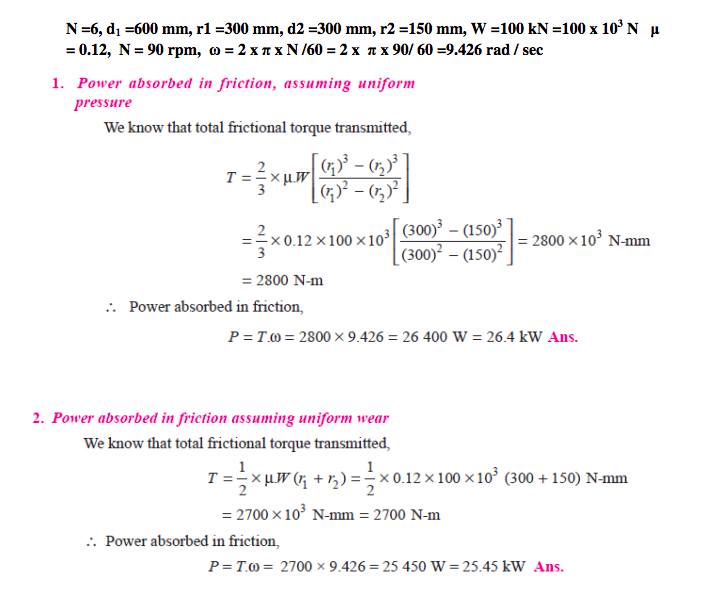 In the above equation when frictional force adds to the breaking torque. 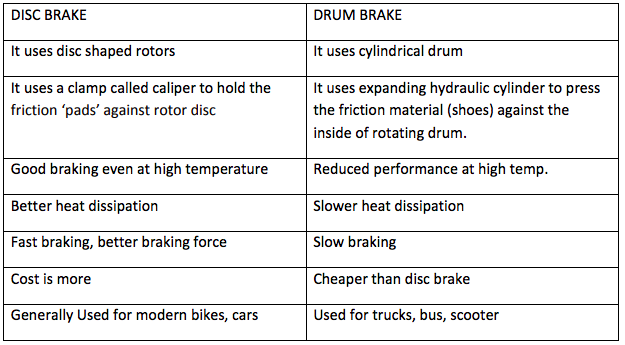 In other words, the frictional torque and braking torque are in the same direction its a self locking brake. Hence, P is not required for braking and brake gets applied on its own. It is called as self energizing brake. 1. Heavy side thrust causes bending of the shaft. 2. More wear & tear as the contact surface is large. 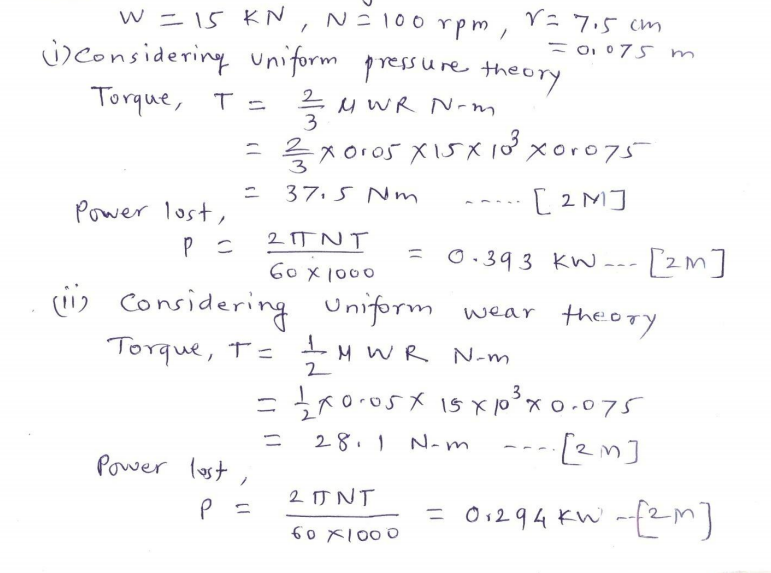 When the product of pressure and area of the contacting surface transmitting load is taken as constant to determine the axial force & torque, it is termed as uniform wear theory as it is assumed that wear along the surface is uniform. An internal expanding brake consists of two shoes S1 and S2. The outer surface of the shoes are lined with some friction material (usually with Ferodo) to increase the coefficient of friction and to prevent wearing away of the metal. Each shoe is pivoted at one end about a fixed fulcrum O1and O2 and made to contact a cam at the other end. When the cam rotates, the shoes are pushed outwards against the rim of the drum. The friction between the shoes and the drum produces the braking torque and hence reduces the speed of the drum. The shoes are normally held in off position by a spring . The drum encloses the entire mechanism to keep out dust and moisture. This type of brake is commonly used in motor cars and light trucks. A shaft has number of collars integral with it. The external diameter of the collars is 400 mm and the shaft diameter is 250 mm. 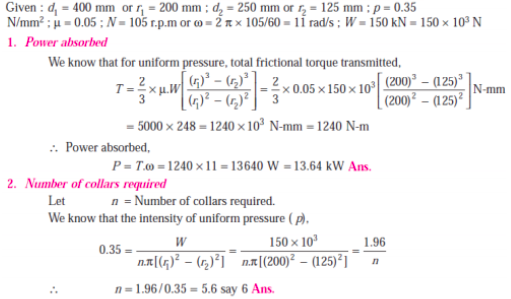 If the uniform intensity of pressure is 0.35 N/mm2 and its co-efficient of friction is 0.05; find (i) power absorbed in overcoming friction when shaft rotates at 105 rpm and carries a load of 150 kN, and (ii) number of collars required. Compare Brakes & Dynamometers: A dynamometer is a mechanical device used to indirectly measure the power output of a prime mover like an engine or a motor. Examples: hydraulic brake dynamometer, eddy current dynamometer, prony brake dynamometer. A brake is a mechanical device usually found in automobiles that helps in decelerating a vehicle and brings it to a complete stop. Examples: internal expanding shoe brake, single and double shoe brake, simple and differential band brake. Eddy Current Dynamometer : It consists of a stator on which are fitted a number of electromagnets and a rotor disc made of copper or steel and coupled to the output shaft of the engine. 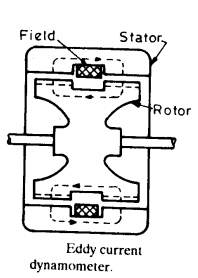 When the rotor rotates, eddy currents are produced in the stator due to magnetic flux set up by the passage of field current in the electromagnets. These eddy currents oppose the motion of the rotor thus loading the engine. The eddy currents are dissipated in producing heat so that this type of dynamometer also requires some cooling arrangements. The torque is measured similar to absorption dynamometers i.e. with the help of moment arm. The load is controlled by regulating the current in the electromagnets. A simple band brake is operated by lever 40 cm long. The brake drum diameter is 40 cm and brake band embrance 5/8 of its circumference. One end of band is attached to a fulcrum of lever while other end attached to pin 8 cm from fulcrum. The co-efficient of friction is 0.25. The effort applied at the end of lever is 500 N. Find braking torque applied if drum rotates anti-clockwise and acts downwards. 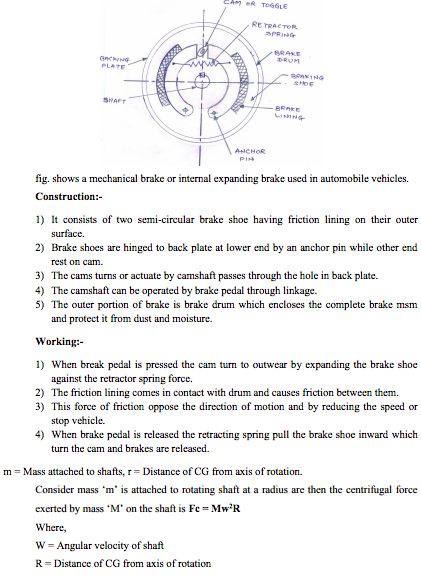 (i) Disc brake: Used in two wheelers as well as in four wheelers. 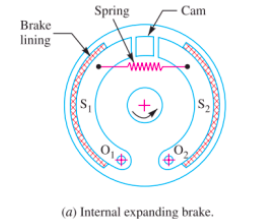 (ii) Internal expanding brake: Used in motor cars, light trucks, two wheelers etc. 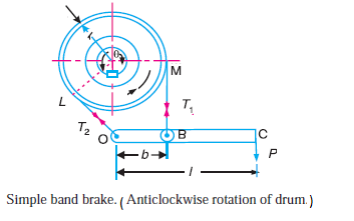 A simple band brake shown in figure 2 is applied to a shaft carrying a flywheel of mass 250 kg and of radius of gyration 300 mm. The shaft speed is 200 rpm. The drum diameter is 200 mm and the coefficient of friction is 0.25. The dimensions a and l are 100 mm and 280 mm respectively and the angle β = 135o. 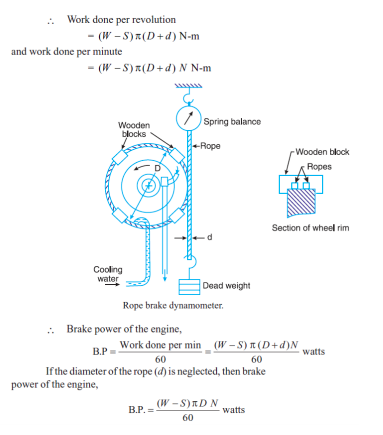 Determine (i) the brake torque when a force of 120 N is applied at the lever end. (ii) the number of turns of the flywheel before it comes to rest. (iii) the time taken by flywheel to come to rest. A conical pivot with angle of cone as 100o, supports a load of 18 kN. The external radius is 2.5 times the internal radius. The shaft rotates at 150 rpm. If the intensity of pressure is to be 300 kN/m2 and coefficient of friction as 0.05, what is the power lost in working against the friction ? 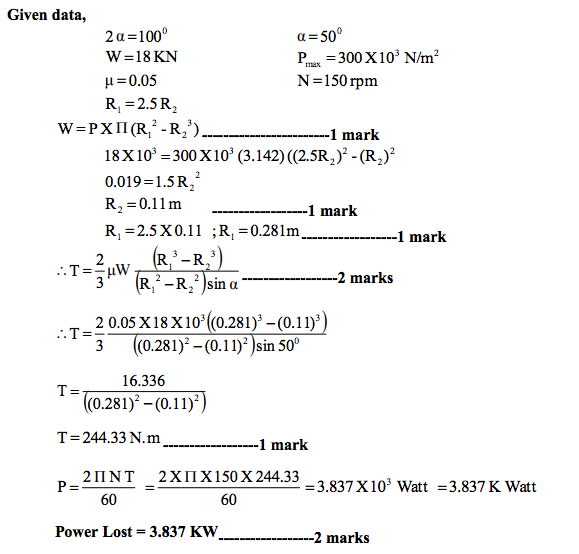 Determine the power lost in a footstep bearing due to friction if a load of 15 kN is supported and the shaft is rotating at 100 r.p.m. 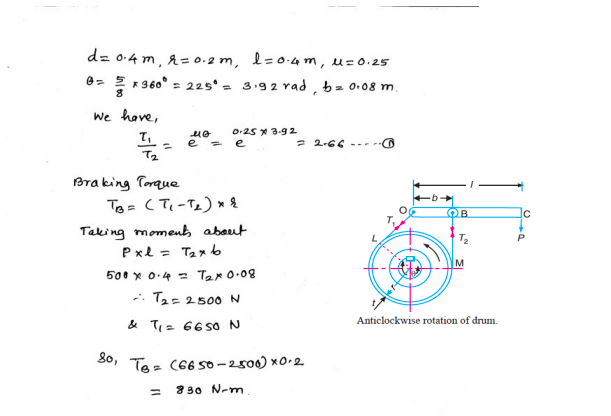 The diameter of bearing is 15cm and coefficient of friction is 0.05. Assume : (i) Uniform wear condition (ii) Uniform pressure condition. 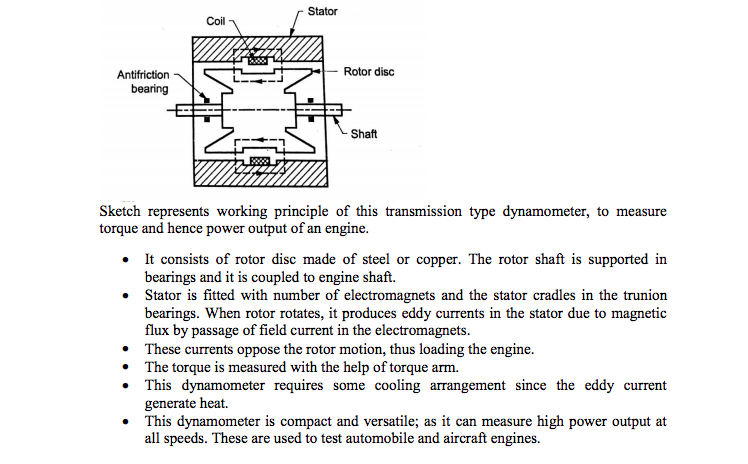 Function of dynamometer: A dynamometer is a brake but in addition it has a device to measure the frictional resistance. 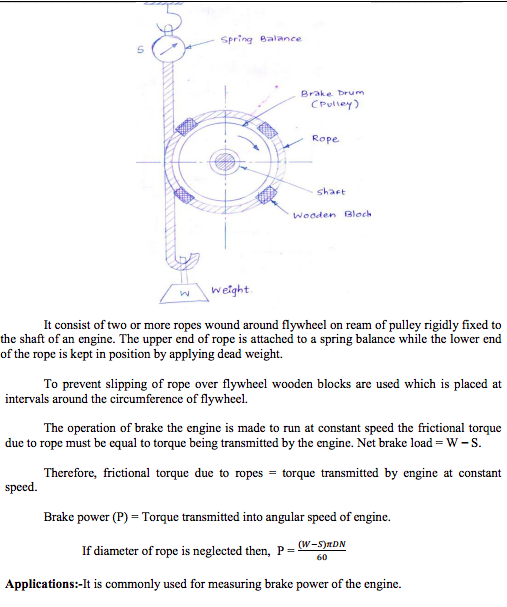 Knowing the frictional resistance, we may obtain the torque transmitted and hence the power of the engine. 1. Prony brake dynamometer, and 2. Rope brake dynamometer. 1. Epicyclic-train dynamometer, 2. Belt transmission dynamometer, and 3. Torsion dynamometer. Hydraulic dynamometer is also called as water brake absorber. Invented by British engineer William Froude in 1877 in response to a request by the Admiralty to produce a machine capable of absorbing and measuring the power of large naval engines, water brake absorbers are relatively common today. The schematic shows the most common type of water brake, known as the "variable level" type. Water is added until the engine is held at a steady RPM against the load, with the water then kept at that level and replaced by constant draining and refilling (which is needed to carry away the heat created by absorbing the horsepower). The housing attempts to rotate in response to the torque produced, but are restrained by the scale or torque metering cell that measures the torque. A thrust shaft of a ship has 6 collar of 600 mm external diameter and 300 mm internal diameter. The total thrust from the propeller shaft is 100 kN. 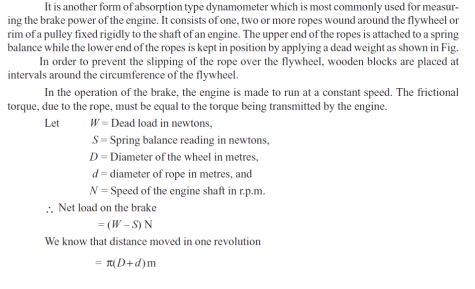 If the coefficient of friction is 0.12 and speed of engine 90 rpm. 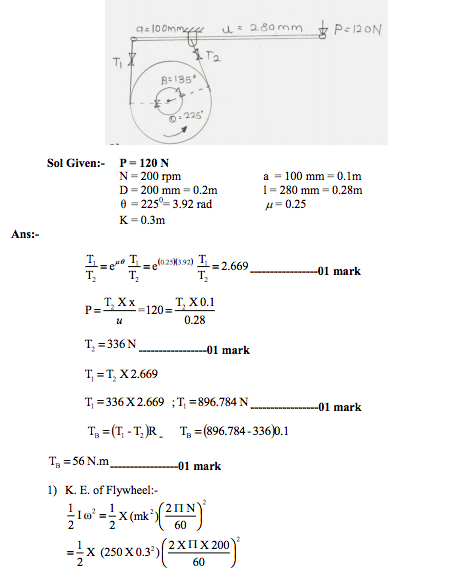 Find power absorbed in friction at the thrust block using uniform pressure intensity condition. A simple band brake is operated by lever 40 cm long. The brake drum diameter is 40 cm and brake band embrance 5/8 of its circumference. One end of band is attached to a fulcrum of lever while other end attached to pin 8 cm from fulcrum. The coefficient of friction 0.25. The effort applied at the end of lever is 500 N. Find braking torque applied if drum rotates anticlockwise and acts downwards. Brakes : A brake is a device by means of which artificial frictional resistance is applied to a moving machine member, in order to retard or stop the motion of a machine. The brake absorbs either kinetic energy of the moving member or potential energy given up by objects being lowered by hoists, elevators etc. The energy absorbed by brakes is dissipated in the form of heat. This heat is dissipated in the surrounding air (or water which is circulated through the passages in the brake drum) so that excessive heating of the brake lining does not take place. Dynamometers : A dynamometer is a brake but in addition it has a device to measure the frictional resistance. 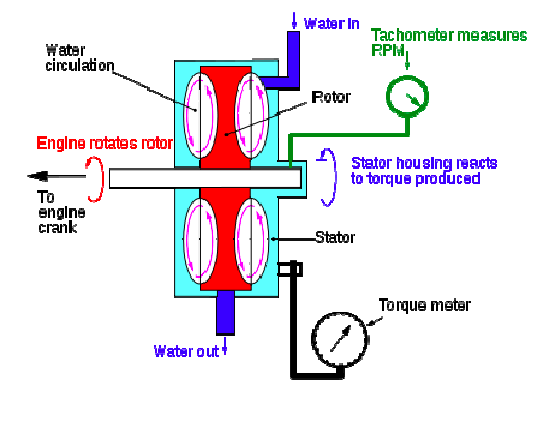 Knowing the frictional resistance, we may obtain the torque transmitted and hence the power of the engine. A casting weighing 9 kN hangs freely from a rope which makes 2.5 turns round a drum of 300 mm diameter revolving at 20 rpm. The other end of the rope is pulled by a man. Taking μ = 0.25, determine (i) the force required by the man (ii) the power to raise the casting. θ =2.5x2π = 5 π rad.